If you grew up in the 80s and had a radio, you definitely have a special place in your heart for the beauty that is Pat Benatar. Last night’s show at the Paramount not only showcased Benatar’s ability to still rock the house, but her love of music, fans and her husband. Like a true polite professional (and frankly rare these days) the show began promptly at 8 p.m. with a montage of images with voice over from Benatar and husband, Neil Giraldo, sharing memories of their 37-year journey. Dressed in all black and still seductively rocking short hair and leather pants, the queen took the stage. But this wasn’t just a Pat Benatar show; this was a couple’s gig. Kissing hubby Neil Giraldo, Benatar began the show by advising the crowd that her “stories were long” and then headed right into “You Better Run.” The striking thing about Benatar, even after a 40+ year music career, is that her commanding voice still sounds exactly the same as it did blaring from our ghetto blasters. 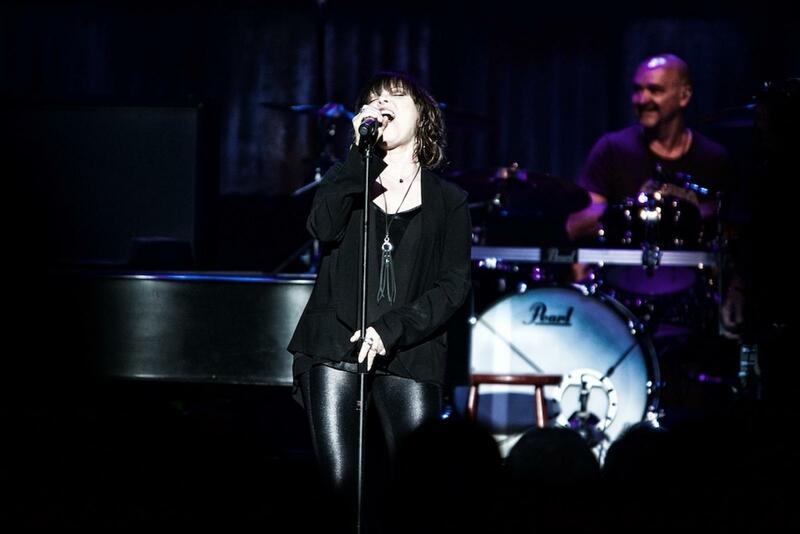 Instrument-less, Benatar was free to focus on her vocals and tell her stories. Moving onto “All Fired Up,” it was apparent that the songs chosen also absolutely focused on Giraldo’s wicked guitar skills. He had several guitar solos, and with his shirt unbuttoned, chains flying, Giraldo fit the role of silver rocker fox perfectly. Sharing that this was their fourth show of the tour, their 37th anniversary tour and their 34th year of marriage solidified the heart and soul that was in this show. Benatar explained that writing about themselves “was like creepy and weird so we started writing about other people’s problems.” Propelled by drummer Chris Ralles beating on a box, the band went into their 1985 hit "Outlaw Blues." Lit like an ’80s angel, Benatar sang, “We’re running with the shadows of the night so baby take my hand it’ll be all right.” The crowd was on their feet. And to keep them there, she went straight into “Shadows of the Night,” which was no ordinary pop single, all hope and rebellion screaming from radios and televisions. Benatar and Giraldo moved through the set with “Invincible,” a short Prince tribute of “When Doves Cry,” and the super prime time “We Belong.” Benatar reminded fans just how our brains can in some weird way forget where we put our coffee, but can remember all the lyrics to every single song.